Remarkable video footage from RC models. Making of: FPV Air2Air Hydroplane from flip on Vimeo. Florida lawmakers just can't get it right. Sunshine State? Not yet. As a blazing sun bore down this week, Southwest Florida got a sweltering reminder of true solar power. With the intensity and frequency of its sunshine, Florida should be a world leader in harnessing this potent form of renewable energy. Yet, the state has only a handful of commercial solar arrays, offers a paltry $5 million rebate program and serves merely as a conduit for federal stimulus funds targeted to renewable energy projects. Despite good goals set by Gov. Charlie Crist, Florida has done too little to increase the use and generation of solar power or to encourage businesses or jobs in developing, supplying or installing the equipment. Behind the scenes...how RC gear really works. RC Gear from Crazy Builders on Vimeo. This is a pretty interesting explanation of how RC, Radio Control, gear works. We take a lot of this for granted but when you see what goes on behind the scenes you understand just how remarkable the technology is today. Wait for the end. Pretty funny. 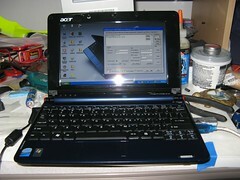 My new netbook, and Acer Aspire One. This one is running Windows XP and is functioning as the server that uploads data to http://bbbrown.mysolarlog.com/ . It takes the place of a headless Dell machine running Windows Vista. This change reduces energy consumption of the server by 1.22 kwh per day. This is a significant savings over the old machine and is just one little bit of energy that we are no longer consuming. It is amazing how many small things we have plugged in that are sucking small amounts of energy. It all adds up. Talk about a steady decline. Internet Explorer has been gliding down from the altitude it got by being bundled with all new computers. Does this mean that the PC user community is getting more savvy with time? Firefox shows a steady growth. I just tested the new Safari 4 on my Mac and it has some very nice features. I believe that it is built on the Gecko engine like the new Firefox. I have also test Chrome by Google and it is really fast but as of yet has few addons or enhancements. For now, I will stick with Firefox as my web browser. Dramatic gains in truck efficiency through aerodynamic testing. During a decade spanning the 1970s and 1980s, Dryden researchers conducted tests to determine the extent to which adjustments in the shape of trucks reduced aerodynamic drag and improved efficiency. During the tests, the vehicle's sides were fitted with tufts, or strings, that showed air flow. The investigators concluded that rounding the vertical corners front and rear reduced drag by 40 percent, yet decreased the vehicle's internal volume by only 1.3 percent. Rounding both the vertical and horizontal corners cut drag by 54 percent, resulting in a three percent loss of internal volume. A second group of tests added a faired underbody and a boat tail, the latter feature resulting in drag reduction of about 15 percent.